In the early hours of May 6, 1856, the steamboat Effie Afton barreled into a pillar of the Rock Island Bridge the first railroad bridge ever to span the Mississippi River. Soon after, the newly constructed vessel, crowded with passengers and livestock, erupted into flames and sank in the river below, taking much of the bridge with it. The official title of the case was Hurd et al. v. The Railroad Bridge Company, but it could have been St. Louis v. Chicago, for the transportation future of the whole nation was at stake. Indeed, was it to be dominated by steamboats or by railroads? Conducted at almost the same time as the notorious Dred Scott case, this new trial riveted the nation's attention. 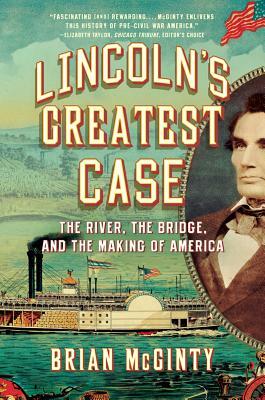 Meanwhile, Abraham Lincoln, already well known as one of the best trial lawyers in Illinois, was summoned to Chicago to join a handful of crack legal practitioners in the defense of the bridge. While there, he succesfully helped unite the disparate regions of the country with a truly transcontinental rail system and, in the process, added to the stellar reputation that vaulted him into the White House less than four years later.